When project-based learning is infused with technology, it may look and feel like a 21st-century idea, but it's built on a venerable foundation. Projects make the world go 'round. For almost any endeavor -- whether it's launching a space shuttle, designing a marketing campaign, conducting a trial, or staging an art exhibit -- you can find an interdisciplinary team working together to make it happen. When the project approach takes hold in the classroom, students gain opportunities to engage in real-world problem solving too. Instead of learning about nutrition in the abstract, students act as consultants to develop a healthier school cafeteria menu. Rather than learning about the past from a textbook, students become historians as they make a documentary about an event that changed their community. Especially when it's infused with technology, project-based learning may look and feel like a 21st-century idea, but it's built on a venerable foundation. Confucius and Aristotle were early proponents of learning by doing. Socrates modeled how to learn through questioning, inquiry, and critical thinking -- all strategies that remain very relevant in today's PBL classrooms. Fast-forward to John Dewey, 20th-century American educational theorist and philosopher, and we hear a ringing endorsement for learning that's grounded in experience and driven by student interest. Dewey challenged the traditional view of the student as a passive recipient of knowledge (and the teacher as the transmitter of a static body of facts). He argued instead for active experiences that prepare students for ongoing learning about a dynamic world. As Dewey pointed out, "Education is not preparation for life; education is life itself." Maria Montessori launched an international movement during the 20th century with her approach to early-childhood learning. She showed through example that education happens "not by listening to words but by experiences upon the environment." The Italian physician and child-development expert pioneered learning environments that foster capable, adaptive citizens and problem solvers. Jean Piaget, the Swiss developmental psychologist, helped us understand how we make meaning from our experiences at different ages. His insights laid the foundation for the constructivist approach to education in which students build on what they know by asking questions, investigating, interacting with others, and reflecting on these experiences. Against this theoretical background, problem-based learning emerged more than half a century ago as a practical teaching strategy in medicine, engineering, economics, and other disciplines. With this approach, students are challenged to solve problems or do simulations that mimic real life. (See Schools That Work: Project-Based Learning in Maine.) Although problems are defined in advance by the instructor, they tend to be complex, even messy, and cannot be solved by one "right" or easy-to-find answer. This is how medical students, for instance, learn to diagnose and treat actual patients -- something they can't learn in a lecture hall. Unlike textbook-driven instruction, problem-based learning puts the student in charge of asking questions and discovering answers. In K-12 education, project-based learning has evolved as a method of instruction that addresses core content through rigorous, relevant, hands-on learning. Projects tend to be more open-ended than problem-based learning, giving students more choice when it comes to demonstrating what they know. (Get tips from the blog, "20 Ideas for Engaging Projects.") Unlike projects that are tacked on at the end of "real" learning, the projects in PBL are the centerpiece of the lesson. Projects are typically framed with open-ended questions that drive students to investigate, do research, or construct their own solutions. For example: How can we reduce our school's carbon footprint? How safe is our water? What can we do to protect a special place or species? How do we measure the impact of disasters? Students use technology tools much as professionals do -- to communicate, collaborate, conduct research, analyze, create, and publish their own work for authentic audiences. Instead of writing book reports, for instance, students in a literature project might produce audio reviews of books, post them on a blog, and invite responses from a partner class in another city or country. 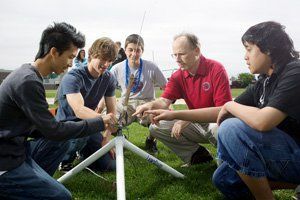 A number of trends have contributed to the adoption of project-based learning as a 21st-century strategy for education. Cognitive scientists have advanced our understanding of how we learn, how we develop expertise, and how we begin to think at a higher level. Fields ranging from neuroscience to social psychology have contributed to our understanding of what conditions create the best environment for learning. Culture, context, and the social nature of learning all have a role in shaping the learner's experience. These insights help to explain the appeal of PBL for engaging diverse learners. Although PBL applies across disciplines, it consistently emphasizes active, student-directed learning. Why is this approach more likely than rote memorization to lead to deeper understanding? Relevance plays a big role. Projects give students a real-world context for learning, creating a strong "need to know." Motivation is another factor. Projects offer students choice and voice, personalizing the learning experience. By design, projects are open-ended. This means students need to consider and evaluate multiple solutions and, perhaps, defend their choices. All these activities engage higher-order thinking skills. Another trend that is fueling interest in PBL is our evolving definition of literacy. Learning to read is no longer enough. Today's students must to be able to navigate and evaluate a vast store of information. This requires fluency in technology along with the development of critical-thinking skills. PBL offers students opportunities not only to make sense of this information but also to expand on it with their own contributions. Finally, today's students will face complex challenges when they complete their formal education. Knowing how to solve problems, work collaboratively, and think innovatively are becoming essential skills -- not only for finding future careers but also for tackling difficult issues in local communities and around the world. To respond to these complex demands, a growing number of teachers, schools, and even states have adopted project-based learning. In some cases, PBL is proving an essential ingredient in school redesign. New Tech Network, Expeditionary Learning, the EAST Initiative, and Envision Schools are just a few examples of programs that are integrating PBL into school-wide models to prepare students for the future. Project-based learning is not without its challenges. It's demanding of students -- and of teachers. Especially for teachers who have never experienced PBL before, projects require planning and management skills that may be unfamiliar. What's more, PBL puts teachers in the role of facilitator rather than classroom expert. Teachers may benefit from professional development to help them expand their classroom "tool kit" of teaching strategies. Just as it's essential that students buy in to PBL, teachers also need to feel empowered. Support from administrators, parents, and other community members can help teachers and students to overcome challenges and make the most of PBL opportunities. As PBL gains advocates and gathers momentum, the education community will continue to exchange ideas and collaborate on projects, making this powerful method of preparing students for the future even better.